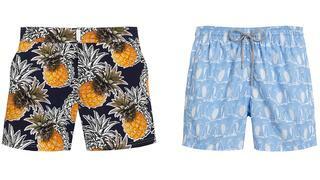 Roland Herlory, CEO of designer swimwear company Vilebrequin, bought his first pair of shorts from them in the early 1980s – little did he know he would end up running the company, he tells Shaun Phillips. We’re shaking hands in the bar of the Gore hotel, South Kensington, when Roland Herlory’s iPhone rings. He apologises for taking the call but its importance is apparent from the concerned expression of the CEO of Vilebrequin, the luxury swimwear company. Thousands of miles away in the Caribbean, Hurricane Gonzalo is building to a category four cyclone. The Frenchman lives on the island of Saint Barthélemy and he has been waiting for news. “Apparently three people on a boat are missing,” he says later. He doesn’t know whether his own home is damaged. The youthful looking 51-year-old, whose company produces swimwear in the three-to-four figure bracket (its Sapphire Blue Lagoon shorts, for instance, bedecked with the company’s trademark turtles woven from gold thread, plus a gold ingot and a sapphire, cost £6,500), is casually attired in a deep-blue velvet jacket, an open-neck shirt and dark jeans. He offers a potted history of how St Barths, where he has lived for 13 years, became known as the St Moritz of the Caribbean, when the Rockefeller family and a clutch of like-minded plutocrats first divvied up the island in the 1950s. It was thanks to a friendship fostered while working in the Hermès shop that he ended up in the driving seat of Vilebrequin. Raised in his parents’ Parisian perfumery, Herlory prides himself on his salesmanship – “that’s my DNA. I love to please somebody; the most difficult client is the most interesting client” – and was so effective at it that one woman’s American husband demanded to “meet that guy who’s selling so much to my wife”. That man was Morris Goldfarb, chairman of G-III Apparel Group, which is the licence-holder to a string of fashion brands such as Levi’s, Calvin Klein and Tommy Hilfiger. 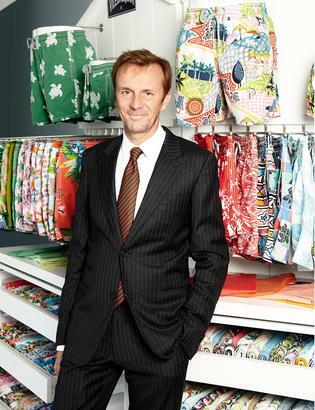 Herlory became a family friend and when Goldfarb was considering adding Vilebrequin to his portfolio two years ago, he asked the Frenchman what he thought of it. Goldfarb asked Herlory to be the CEO of the company when he bought it, but Herlory wanted to open an art gallery in St Barths, not “jump [back] into the nightmare of travel”. So the American made him an irresistible offer: run Vilebrequin and its outlets – from Miami to Shanghai – remotely from St Barths. For the second time, he says, he’d met a man prepared to adapt an organisation to fit him personally. Herlory is careful to emphasise his respect for Vilebrequin’s heritage, but his strategy is to develop it into a lifestyle brand. Since taking over in 2012, his new creative team have designed the company’s first womenswear collection and expanded its repertoire of ready-to-wear fashion and accessories.